Al Mouj Muscat First in the Abu Dhabi In-Port Races. 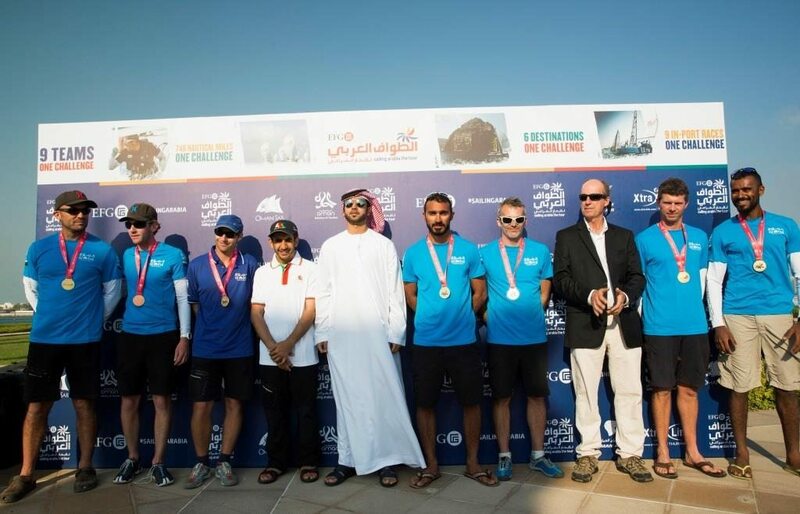 Omani team Al Mouj Muscat proved themselves a force to be reckoned with as they swept to victory in EFG Sailing Arabia – The Tour’s second round of inshore racing. The team, entering the 730 nautical mile race around the Gulf region for the first time, won two of the four intense sprints that made up the Abu Dhabi In-Port Race series. Held in the coral blue waters off Abu Dhabi’s iconic Corniche and framed by the grand Presidential Palace and Emirates Palace Hotel, the racing saw Al Mouj, Muscat, under the expert leadership of French sailor Nico Lunven, dominate the nine international crews to finish the day as winners of Abu Dhabi In-Port series. They even managed to get the better of reigning EFG Sailing Arabia – The Tour champion Sidney Gavignet and his EFG Bank Monaco crew, who came second overall. The event also saw Team Zain, crewed by employees of the Kuwaiti telecommunications company, take third place overall in the inshore racing with a solid performance. With French sailor Cedric Pouligny at the helm, Team Zain finished third in the second race of the day then followed it up with a first place in race three. British crew Team Averda completed the Abu Dhabi In-Port Race series podium. Leg 1 from Dubai to Abu Dhabi saw the nine crews race 61nm in light northerly winds on Tuesday. Team Averda claimed victory in the leg, adding to the win in the Dubai In-Port Race series. Team EFG Bank Monaco were just minutes behind them after a hard-fought battle with the Brits, while Team Zain scored a third on the opening leg. Leg 2 will be the biggest test yet for the nine crews as they do battle across the Persian Gulf. With winds forecast to be light – around 10 knots from the north east – it is expected the stage will take around 36 hours to complete. Team Zain skipper Pouligny said his team of amateurs rose to the challenge of competing against some of the world’s best sailors, “We had a very nice day today. The legs were very short and the racing was intense, and we improved throughout the day. Our team is made up of Zain employees, some of whom have only sailed three days in their lives, so we’re delighted with today’s result. Four races in a row is full on but we rose to the challenge.